Poznań was incorporated into Prussia following the Second Partition of Poland in 1793. At that time, Germans sought to give the city German character and attract to the capital of Wielkopolska as many German settlers as possible. Consequently, a number of investments were made in order to turn Poznań into a city friendly to German settlers. It translated into founding German libraries, museums, theatres, and in the early twentieth century - monumental Castle District. Poles, united in their resistance against Germans, chose the tactics of passive resistance and sought to strengthen Polish structures through the Organic Work [social and economic development approach]. The period saw establishment of institutions and companies concerned about Polish culture and language, as well as co-operatives and banks granting loans to Polish entrepreneurs. The oldest of the buildings located at Wolności Square is the Raczyński Library. The library was funded by Count Edward Raczyński and built between 1822 and 1929. It has been used to house Count Raczyński's collections, regularly enlarged with each new publication released in the Grand Duchy of Posen. The classicist edifice, specifically its front elevation, is modelled after the east wall of Paris Louvre. It was the first building in Poland to be erected specifically to house library collections. Near the Wolności Square we can see the building of the National Museum, built between 1900-1903, with its form alluding to Berlin's Karl-Friedrich-Museum. Design and decor of both buildings were to display German power. Having regained independence in 1919, Kaiser-Friedrich Museum was transformed into Museum of Wielkopolska, and then, in 1950, the National Museum. External decor made by German artists was replaced with Polish ones. Today, the main building includes the Polish Art Gallery, International Art Gallery, Poster and Design Gallery, Contemporary Art Gallery, as well as a Prints Hall and Numismatic Hall. The National Museum includes five Poznań branches and three in the Region of Wielkopolska. 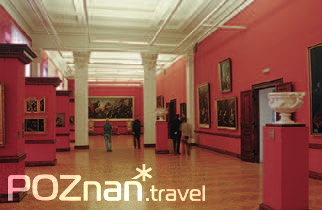 In the Painting and Sculpture Gallery of the National Museum you can admire, among others, the collections of Western-European painting. On the right-hand side of the museum is a historical building of the Hotel Bazar. The building was built between 1838 and 1842 and immediately became the centre of Polish economic and social life. The Bazar hosted Wielkopolska landowners, and on the ground floor, according to the statute, one could find only Polish merchants' stores. It is worth emphasising that it housed the first store room of Poznań's greatest entrepreneur of the nineteenth century - Hipolit Cegielski. The building also made history thanks to composer, Ignacy Paderewski, who in December 1918 gave a patriotic speech to Poznańians from the balcony of his room. Later the same day, Poznań saw an outbreak of the Greater Poland Uprising (Wielkopolska Uprising), as a result of which Wielkopolska returned to Poland after more than 120 years. 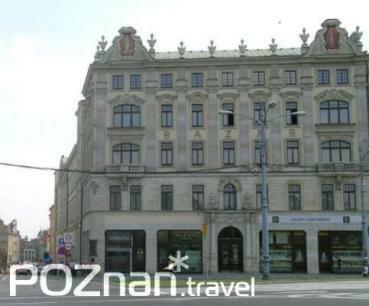 On the other side of the Wolności Square, our attention is drawn to the Arcadia building. The name 'Arcadia' is derived from a cafe and restaurant formerly located in this building. In the early nineteenth century, a royal theatre was built in the place of today's Arcadia; it hosted a number of performances and concerts, including Poznań's premiere of Stanisław Moniuszko's 'Halka.' The present building was erected for a new City Theatre, dubbed as 'German' - to distinguish it from similar Polish Theatre. The building, besides the aforementioned 'Arcadia' cafe, included Poznań's branch of Polish Radio. Today, it houses, among others, the City Information Centre. Carry on your walk along 27 Grudnia Street. Pass the junction with Ratajczaka Street. A few dozen metres away is a University Library, built in 1902 as the Kaiser-Wilhelm-Bibliothek. Even in the 1970s 27 Grudnia Street was lined towards Okrąglak with nineteenth-century tenements. They were demolished in order to implement future investments, which have never been realised. As a result, we do not have to search for the Polish Theatre (built between 1873 - 1875) at one of the courtyards, since it is clearly visible from 27 Grudnia Street, and its architecture resembles the German Theatre building located in Arkadia. The Polish Theatre was funded from public donations originating from all annexed territories, which was commemorated on the facade by an inscription reading 'The nation for itself'. Go down Fredry Street and enter the Castle District, marked out in the early twentieth century. At that time Wilhelm II announced the dismantling of obsolete fortifications that strangled city's development and the fortifications Germans replaced with a representative district, to emphasise city's German character. You are approaching Collegium Maius. The edifice was constructed in 1908 to provide office space for the Prussian Colonisation Committee, an institution committed to buying out land from Poles and populating it with German settlers. Both the internal and external decor referred to German history and culture. At present, the building is operated by the Adam Mickiewicz University and the University of Medical Sciences. A few dozen meters away, you can find a neo-classical edifice of Great Theatre, constructed between 1909-10 as a branch of the Berlin Opera. The front elevation of the theatre is adorned by six Ionic columns, with a sculpture of Pegasus dominating them (the former name of the theatre was 'the Pegasus Edifice'. The theatre can accommodate 900 spectators. At the Great Theatre, turn left towards Mickiewicz Park and go to Adam Mickiewicz Square. On the west side of the square is the Collegium Minus. The building was built between 1905 and 1910 for the Prussian Royal Academy. Today, it houses Rector's Office of the Adam Mickiewicz University. Inside the building there are two halls - a large hall and a small one, known as the Lubrański Hall. 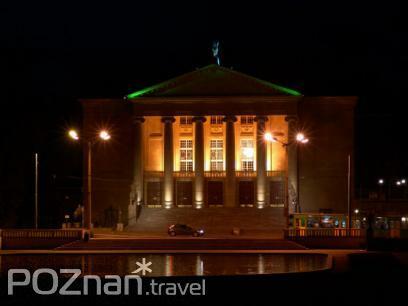 The University Hall is one of the most famous concert halls in Poland. It hosts numerous musical events, including Henryk Wieniawski Violin Competition. On the east side of the square you can see the monumental edifice of the former Imperial Castle. 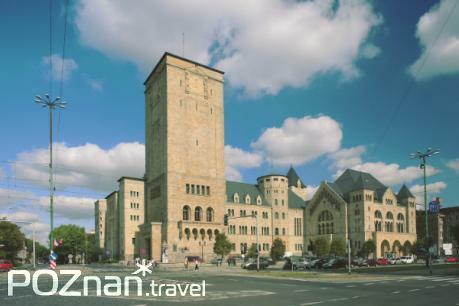 This huge neo-Romanesque building was designed by Franz Schwechten. 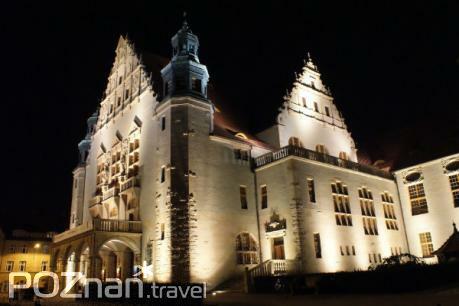 It was built between 1905-1910 for Emperor Wilhelm II, who attended the opening ceremony. The style and grand scale were to render the status of the German power, while the Romanesque character of the building was considered as being very Germanic. In the interwar period, the castle was the seat of the Presidents of the Second Republic of Poland and the Poznań University. It was the workplace of the scientists who broke the German Enigma code. During the Second World War, however, the building served as Hitler's residence. It was then that the interior was remade in the Third Reich's style with participation of Albert Speer, Hitler's court architect. The dominant feature of the building is the clock tower, originally 74-m high. After the war, the tower, destroyed during the war, was lowered by about 20 m. The Rose Courtyardfeatures a fountain inspired by the thirteenth-century fountain with lions from Granada's Alhambra. Today the castle houses the 'Zamek' Cultural Centre, the Animation Theatre and many other institutions and hosts numerous exhibitions, meetings and concerts.